Just like yesterday, I still remember vividly the leader of the Indigenous people of Biafra who also doubles as the director of radio Biafra/Television, Mazi Nnamdi Kanu warning you during one of his broadcasts, when you started this your now famous or do I say infamous dance of shame called Bring Back our Girls (#BBOG). Mazi Nnamdi Kanu had unequivocally warned you then that you will definitely come back in shame if you continue with the shameful dance. At the time of that timely warning from Nnamdi Kanu it seem so unlikely, infact impossible even in a million years because the ovation was at it loudest for you and your movement. You were the rave of the moment then. You were the activist per excellence. You trended on twitter and other social networks. You were hailed to high heavens. You were the daring of those that wanted president GEJ out. The never-get-to-see parents of the missing Chibox girls and the Chibok community sang your praises. You were the toast of the APC political party and her presidential aspirant, African Hitler Muhammdu Buhari (AHMB). They rode on the back of your ‘my charity starts and ends from outside movement called the #BBOG’ to the win the 2015 elections. The unfortunate thing is that those that hailed yesterday have now christened you ‘Oby EzekweSILLY’. They now claim that your present ‘’noise making’’ for the ruling party and the president to Bring Back Our Girls’ is nothing but ‘’Notice me activism’’. They said that you are only making noise so that you can equally be ‘settled with an appointment’ from the president like your co-founder of the group who is now the chairman of NPA. They even asked: how can a common 5 percenter like you be nursing such an ambition of ‘political settlement’ in this 97 percenters dominated regime? Are you not aware that the president has promised that 5 percenters can only get what the constitution allows? They even said that you are not shamed that those you started chasing lizards with are now chasing and catching rats and rabbits, and you are still there fooling yourself with a march to the presidential villa to see the president who last time did not hid his feelings that you now irritate him. They even quipped that the president was very magnanimous to you during your last march by stopping you with just a finger pointing. They said that if you don’t stop your ‘notice me’ march to disturb their president that ‘palm kiss to the cheek’ is what you will get next time. They now are even asking why you are crying more than the bereaved as according to them even the Chibok girls parent did not join you on your shameful march to disturb their president at the villa. And who will blame them? When even the parents accused you and your group of antagonizing and making unpleasant comments against their president and his government? The Chibok girl parents based in Chibok had this to say as the reason that they did not accompany your group on its march of shame to the villa, according to the interview they recently granted to NAN. ‘’Yakubu Nkeki, who is the leader of the missing girls parents based in chibok said that they met and decided to boycott your march because ‘’All we want is our missing daughters and we are willing to work with anybody who will help us to find our daughters,’’ he said, explaining that they did not want to antagonize the government which is in the best position to help them find their missing daughters. Yana Galang, who is the woman leader of the Chibok parents based in Chibok had this to say ‘’we do not want to do anything that the government will not be happy about. We are not after any organization that is against any party or religion, and we are supporting the federal government to help us RELEASE OUR DAUGHTERS’’. Do I need tell you that from the confession of those that you claim to be fighting for their daughters to be brought back, that you are making their president UNHAPPY? In case you don’t know, they are now accusing you of hypocrisy. They said that your hypocrisy is capable of winning Olympic gold medal. They can’t understand why you are carrying this issue on your head when Fulani herdsmen are killing your fellow Igbos even in Igbo land and you have failed to call for a stop to it or condemn the killings publicly. They are even asking if you are NOT by your action insinuating that the lives of your fellow Igbos are not as important as those you are troubling their president to rescue. Am sure you know those that I refer to as ‘’they?’’ Yes! They are your fellow hailing hailers. Formerly, they saw you as one and equal with them but are currently seeing you as an alone lost 5 percenter in the midst of the 97 percenters. The information reaching me is that there is a plan to clone your #BBOG group like they did with NDA by creating RNDA, IPOB by creating TRIPOB & RE-IPOB and that will present them the perfect opportunity to wrestle the group from you and basis for dumping you. Obiageli aku nwanne m, if I were you, I will use my tongue to count by teeth at this junction. 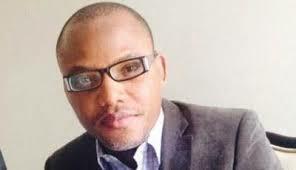 Events’ happening in the country has proven that Mazi Nnamdi Kanu is always right. You will definitely come back in shames if you continue with this your dance of shame.